Regrettably, Western culture lacks such a tradition, defining successful restoration as the process of invisibly repairing damaged objects, returning them to their original appearance. That and an unrelenting glut of consumer goods—from dishes to clothes to furniture—has contributed to the near disappearance of even the most basic form of mending. Why fix something when we can throw it out and replace it? In his recent body of work, Ramekon O’Arwisters explores the idea of mending as art practice: of restoration as a kind of reincarnation in a new and more exalted form. 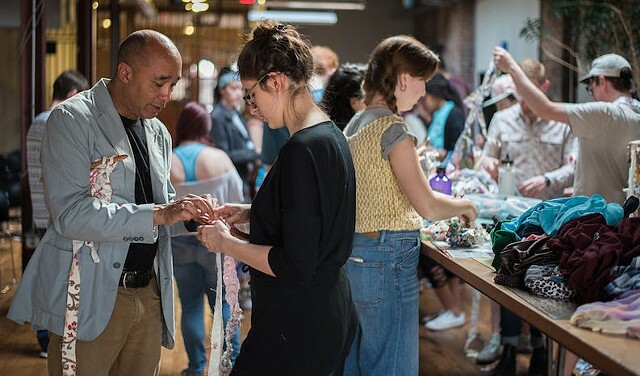 For several years, O’Arwisters has been leading “Crochet Jams,” events in which he leads students, seniors, art fair visitors and social service agency clients in a kind of collaborative craft therapy. By putting crochet hooks into their hands, O’Arwisters gets people to enjoy the process of shared labor, intertwining strips of colorful fabric in the same process that’s used to make rag rugs. A native of North Carolina, O'Arwisters was Introduced to quilt making at an early age by his beloved grandmother during his childhood in 1960s when Jim Crow laws were still in force. He remembers learning how to make something whole and beautiful out of many fragments of cloth. “With her,” the artist recalled, “I was embraced, important, and special. I was a little black boy hiding my queer self from my family . . . before the turbulent years of the Civil Rights Movement that spread throughout the country.” Both the generosity and spiritual healing of his current social practice and his drive to make something out of nothing grew out of those early experiences. The shapes of many of the works on view are clearly meant to invoke vessels, but some are more abstract. In Mending 19, for instance, crocheted curves and circles envelop a tall, narrow vase, like vines overgrowing a neglected monument. In Mending 13, swags of material cradle a broken plate; peering into the small cavity at the top of the piece, gleaming threads suggest veins of gold in Japanese ceramics, or, perhaps, hidden treasure. Mending 18, one of the least vessel-like pieces, is also one of the most compelling, indicative, perhaps, of possible directions the work might take. Jagged fragments of plate become a support for the sculpture’s intricately worked form. Wider than it is tall, it suggests a giant knot perched on dainty sharp feet. Other shards of ceramic protrude from the surface—as if the act of crocheting, like a geological process, had broken the vessel into the bits that now rise to its surface. As much as this work seems singular, there are familial resemblances. 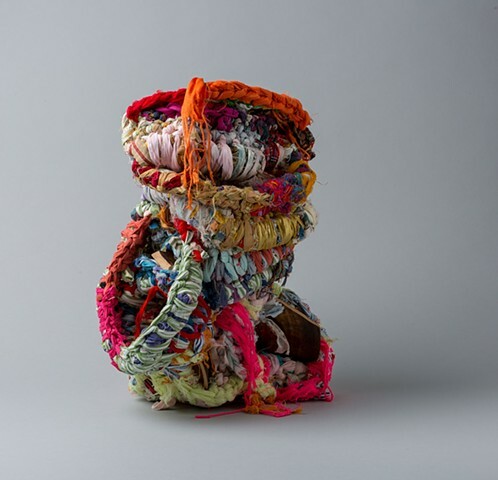 Contemplating the loose threads and tassels of unraveled cloth that create a soft visual aura around some pieces, it’s impossible to ignore a sympathetic resonance with the thread sculpture of revered outsider artist Judith Scott. Michael Lucero’s sculptures, bricolaged together out of ceramic shards, form another branch of the family “tree"—works that are different, yet related, as are Julia Couzens' wrapped and sewn bundles of found textiles. In any case, it is difficult to describe the pleasure that contemplating O’Arwisters’ “mended” objects provide; photographs do them no justice. These are works of art that need to be seen in person, and looked at from all sides. Ramekon O’Arwisters: “Mending” @ Patricia Sweetow through February 10, 2018. Ramekon O’Arwisters is a fabric and social practice artist who likes to say he has “no reverence for systems of control.” He is best known for creating a series of public art events called crochet jams, where he makes a space for people to create a communal work of art. Ramekon came to KALW’s studios to talk with Jen Chien about how his grandmother’s quilt-making, his years as a closeted teen in the South, and how his time at divinity school helped him develop his own ideas on what art can be and do. "Crochet jam is really . . . about stuff that I need in a society that either will or will not provide it. I let go of that. I'll provide it. I'll do it." Ramekon O’Arwisters' current show, Mending, is at the Patricia Sweetow Gallery in San Francisco. The next crochet jam will be there on February 10. Many art galleries in San Francisco will open exhibitions this week and over the weekend. Here is a selection of exhibitions I have seen and recommend highly, followed by a list of shows I intend to see before they close. Admission is free to all, and all are in San Francisco. Check the gallery website for public hours. Fraenkel Gallery, 49 Geary St.
“Art and Vinyl: Artists and the Record Album From Picasso to the Present,” through March 3. A Josef Albers record jacket that looks like the percussion on the LP inside must sound: That’s just one of the terrific, mostly rare objects in this lighthearted review of designs by Jean-Michel Basquiat, Sophie Calle, Jean Dubuffet, Marlene Dumas, Yves Klein, Barbara Kruger, Sol LeWitt, Chris Ofili, Ed Ruscha, Cindy Sherman, Andy Warhol and many others. Brian Gross Fine Art, 248 Utah St.
“Leo Valledor: A New Slant,” through Feb. 24. Valledor (1936-89) brought geometric abstraction to a high pinnacle over his long career, and this exhibition is an excellent overview. His “Ezistance” (1986) is a confounding visual puzzle requiring great force of will to accept that it is hung flat against the wall. Be sure to ask to see the painting in the office, another stunner. 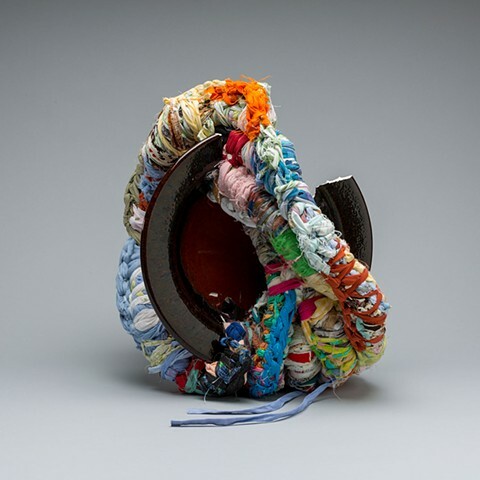 Patricia Sweetow Gallery, 315 Potrero Ave.
“Ramekon O’Arwisters: Mending,” through Feb. 10. O’Arwisters has brought the venerable craft of crochet into the realm of high art. 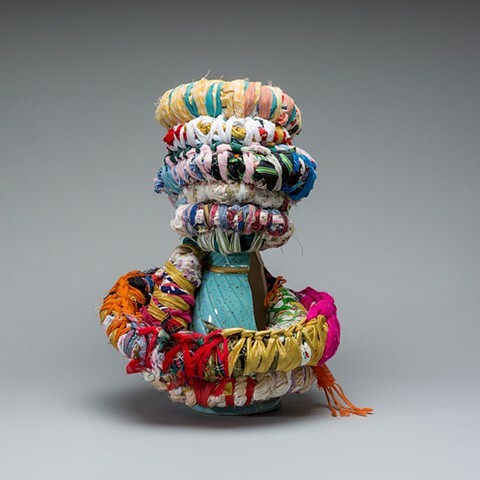 In this new work, he builds his soft sculpture around broken bits of pottery, mourning their damage and attempting, futilely, to heal them at the same time. Nancy Toomey Fine Art Gallery, 1275 Minnesota St.
“Miya Ando — Oborozuki (Moon Obscured by Clouds),” through Feb. 22. Gossamer, dreamlike images of clouds that seem lightly breathed onto their supports are, surprisingly, photographs, albeit printed by unconventional processes. Rena Bransten Gallery, 1275 Minnesota St.
“Rupert Garcia: Rolling Thunder,” through Feb. 24. A survey of five decades of paintings and prints on the theme of war by one of the Bay Area’s most accomplished artists, by which I mean that the work combines commitment to technique and to conscience in equal measure.